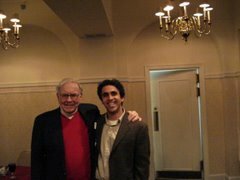 Visit the link below and you can watch the PBS series of Warrren Buffett interviewed by Charlie Rose. I also very strongly recommned watching the interview with Kevin Clayton of Clayton Homes. I just returned from Memphis were I had the good fortune to attend my very first Longleaf Partners Annual Meeting of Shareholders. Although only an hour and a half in length, I was baffled at why I had waited so long to attend. I have been reading about Mason since I was 20 or so but it never occurred to me to attend a annual meeting of a mutual fund. I do not invest in Longleaf--although it would be wise to do so--but Mr. Hawkins, true to his character, was gracious enough to invite me to the meeting and get this--the private dinner for the senior members of the Longleaf team. There is no other mutual fund group, to my knowledge, that offers a more candid communication with thier shareholders. 4. Discipline to say no. It is easy to see that not many people can truly admit that they adhere to these principles. Admittedly when I first started investing my money at 21, I can easily say that I was still in the early stages of developing a sound discplined approach. Having said that, I know now, seven years later, that because of my somewhat "early" start, and my steadfast belief in the principles set forth in The Intelligent Investor, I am very aware of the attributes needed to ensure a successful long-term investment operation. Understand however, that it's the true application over time that shapes the development of these principles. Charlie Munger remarked at the 2007 Berkshire Annual Meeting that "Warren has gotten better over the years." One needs to really think about Munger's statement. Berkshire shareholders have been fablously rewarded because that they have had the good fortune to have the same guy at the helm who has gotten better over time. The point is that over time the investment philosophy will become more sound, your search strategy will improve, the ability to value a business will expand, and your experience should keep you disciplined. If you are not patient, then odds are that you will not do well over time. If you are among the minority that can truly say they mentally grasp the first five principles, and your reasoning and data are right, back up the truck and make a substaintail investment. Forget all the EMT non-sense about diversification. A well-chosen, carefully selected portfolio of 7-10 securities is all you need to have a market beating portfolio. You have to be able to eliminate all the noise and accept the fact that most superior investments will be made at the exact time all the "smart" people want nothing to do with it. In the 1960's Buffett put over 30% of his partnership's assets into American Express amidst a scandal. In 2006, Mohnish Pabrai loaded up on Pinnacle Airlines when everyone thought the airline industry was the worst investment ever. The key to all of this can be summed up in one word: rationality. Success in investing has nothing to do with your IQ level and everything to do with your ability to be rational in your thinking and being able to eliminate all the excess noise. A good investment can usually be explained by three or four fundamental reasons as to why it is underpriced relative to intrinsic value. To draw an analogy, consider the great chess masters Kasprov, Spasky, etc. Chess masters have developed very specific patterns on how to approach a match. While certain adjustments may need to be made, the overall pattern remains the same each time. The same approach and discipline is required in investing. Mohnish Pabrai told me once "that I can eliminate most companies in 10 minutes or less." Why? Because he has his pattern and knows what to look for in a business in order to pursue it further. At Longleaf, and with any sound investment operation, the approach should be both qualitative and quantitative. The key is buy cheap, not what is down in price. On the quantitative side, a margin of safety requirement demands one to look for businesses that are trading at significant discounts to intrinsic values - at Longleaf, they want at least 60%. There also must be qualitative elements as well in the business like shareholder oriented management, a competitive advantage and so forth or otherwise you really don't have a intelligent investment. Mason Hawkins read The Intelligent Investor as a senior in high school. At the meeting he told the partners that the most fundamental concepts to investing are summed up in two Chapters: 8 and 20--Invest with a margin of safety and look at every investment as part ownership in a business. "Capitalism has a way of turning a good idea at a low price into a bad idea at a high price. It makes sense to buy at 6x operating cash flow, but at 14x operating cash flow it is very problematic and harmful to do so using massive leverage." "If you are not willing to look stupid in the short run, you are not likely to be a successful investor in the long-run." Well, it was an interesting AGM this year to say the least. Rather than try to pick through it all, I thought I would provide you with a rather complete transcript of the session. Here is a friend's version. Based on what I heard, this is a fairly accurate transcript. I will add this: it is clear that Buffett is looking beyond North America more and more. He made some very subtle, yet valuable comments alluding as much. According to Buffett, Berkshire has two stakes in German companies. Buffett also indicated that Berkshire is involved in a currency transaction that he will get into next year. "You won't believe it" says Buffett. It's important to realize a couple of things about Berkshire and its forays into foreign investments. First, Buffett hates it when his buying becomes public knowledge. In Germany, for example, laws dictate that upon a 3% accumulation of shares, one must make a public filing. Thus if Berkshire finds an attractive $30 billion company, after accumulating $900 million worth, the word gets out and Berkshire is unable to quietly continue adding to the position at its preferred price. This just one example, but it serves to illustrate that Buffett's "minimal" participation in the global markets doesn't necessarily equate to not having attractive valuations overseas. Buffett has said time and time again, Berkshire's size is such that its performance CAN NOT come close to what is was in the past. Berkshire's need to find investments that can move the needle simply preclude a lot of attractive opportunities domestic and foreign. Buffett is looking very closely at South Africa and has been presented with some very attractive businesses. Looking forward to a great weekend in Omaha. I hope to see all of you there! I will be at the Yellow BRKers gathering on Friday at the Double Tree Hotel. Please introduce yourself if you are there as I am looking forward to meeting everyone who has visited this site.